I have never been a big fan of horror movies. I find they aren't well acted, are poorly written and rely on cheap scares. I liked The Conjuring movies, mainly because they develop and build their characters, and use legitimate scares to rope in the audience. From the first trailers, I thought that Lights Out would end up being the former. The gimmick was interesting enough: when the lights are on, a spirit appears. When they're off, she is gone. The idea captured the trailer, but the rest of it fell into the generic horror film trap. But with all the critical praise surrounding the movie, I became hopeful that maybe it could be more than the trash we normally get. So I went into Lights Out very hopeful. 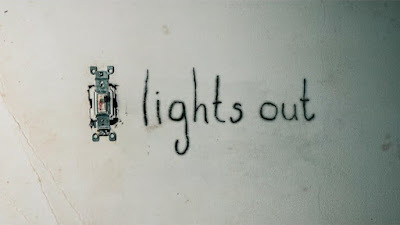 In the end, Lights Out doesn't have the best horror I've ever seen, but it's development of characters and good writing allows it to stand out in the genre. Anyone who has read my site for a while knows my view on M. Night Shyamalan. He struck gold with The Sixth Sense, and it's one of my favorite movies. It was brilliantly done. Unbreakable was decent, and I've pretty much hated every movie he's done since. His last film, The Visit, wasn't God-awful, but it definitely wasn't a step in the right direction. So the trailer for Split, his next movie, came as sort of a surprise. It stars James McAvoy as a man with 23 different personalities who kidnaps a couple girls and holds them captive. McAvoy is a fantastic actor, and he always adds something every time he's on screen. And this kind of premise is something he can really sink his teeth into. So as a synopsis, this film sounds fascinating. Then I saw that Shyamalan was writing and directing it, and I immediately became apprehensive. But, as I watched the trailer, I put that judgment aside and watched it for what it was. DC has really been on a roll with its animated films. Movie after movie has come out and has really knocked it out of the park. However, these films have been all direct to home video, which means I wouldn't normally review it. 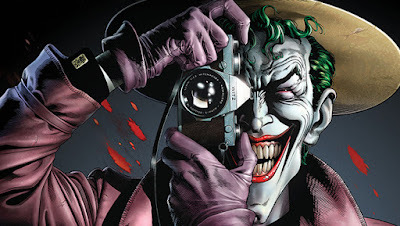 But in the case of Batman: The Killing Joke, it had a limited release in theaters, only two nights, and I got to go to one of these screenings. So I thought I would write up an actual review for it on the site. Going in, I liked the comic book as much as the next guy. It's a staple in Batman comic lore. And of course I was excited to see Kevin Conroy and Mark Hamill returning as Batman and the Joker, respectively. I walked into this movie really excited to see this adaptation, and I didn't walk away disappointed. Whenever this movie told the straight Killing Joke story, it was brilliant. The problems rose when they deviated from that. SDCC 2016: So Who Won Comic Con? Every year, San Diego Comic Con offers up a lot of new and exciting information about upcoming films, particularly comic book movies. We usually get a lot of really cool casting announcements, concept art, posters and trailers. And this year was no exception. Between Marvel and DC, we got tons of really cool stuff. But who exactly won the convention this year? Both studios brought their A-game, and took turns shocking and exciting Hall H. But which studio won? Let's take a look at both sides and determine a true winner. Let's just say I wasn't the biggest fan of Batman v. Superman: Dawn of Justice. It had some really great parts (Ben Affleck as Batman, Gal Gadot as Wonder Woman), as well as some not so great parts (Jesse Eisenberg as Lex Luthor). You can read my full review for the film here. So when news broke that an extended edition of the movie was going to be released, I was excited. I had a lot of problems with the editing of the theatrical cut, as it seemed the editor was trying to maneuver around different cut scenes. So with a longer version, I hoped that the mess of Batman v. Superman would be removed, and what could have been an awesome superhero movie would finally be realized. So I watched the Ultimate Edition with high expectations. In the end, this extended cut does prove to be an improvement over the theatrical cut; it's just not as radical of an improvement as I would have liked. Ever since the end of the first Guardians of the Galaxy, the big question surrounding the franchise has been who is Star-Lord's (Chris Pratt) father? 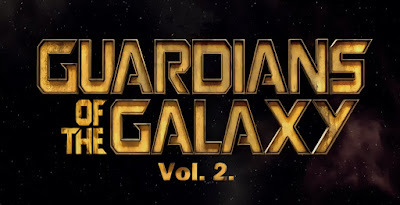 Going into the sequel, director James Gunn said that the reveal of the father would be a central point of the story. News came shortly after that Kurt Russell had been cast as the father, with no news as to which character from the comics it truly was. There was endless speculation, but no confirmation, until now. 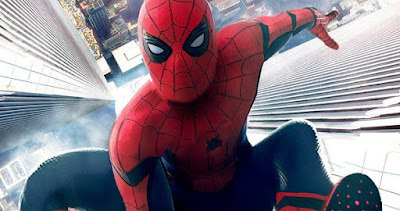 Ever since Tom Holland wowed audiences as Spider-Man in Captain America: Civil War, fans have eagerly turned their eyes to the webslinger's solo film, coming out next summer. We don't know much about the film, other than the fact that Michael Keaton will play the villain. He was heavily rumored to be playing one of Spidey's oldest villains, the Vulture, but it was never confirmed. But now, it seems we officially know Keaton's character. One of the most famous Hulk story lines from the comics is Planet Hulk, in which the Hulk is blasted off into space and crash lands on an alien planet, which he is put into slavery and forced to battle in gladiatorial games. He quickly rises up the ranks and leads a rebellion against the tyrannical king of this world. And for a long time, fans have called for a movie adaptation of this story. It seemed like we would never get it, until it was confirmed that the Hulk (Mark Ruffalo) will be in the upcoming Thor: Ragnarok. 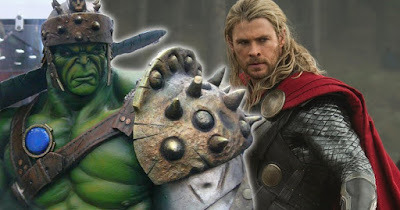 Since then, its been speculated endlessly that the film will borrow elements of Planet Hulk, but this had never been officially confirmed, until now. It was just last San Diego Comic Con where the Kong: Skull Island film was announced, as a sort of prequel to the traditional King Kong story. The movie became even more interesting when it was revealed to be a part of a shared Godzilla/King Kong universe, with this film reintroducing us to the king of the apes. But whether this prequel could stand as its own film remained unknown to me, and something I was waiting to judge until I saw footage for the movie. Well now, at this year's convention, we get our first look at the new film. With the overwhelming disappointment in Batman v. Superman: Dawn of Justice, DC really had to get fans excited again for Justice League. Press were invited to a set visit a few weeks ago (you can read their findings here), and it seemed that the film was heading in the right direction. Director Zack Snyder said he heard fans complaints, and wanting to right Batman v. Superman's wrongs with Justice League. And with San Diego Comic Con this week, we were sure to get more information about the film. However, we got a lot more than just some information... we got a whole f*cking trailer! Wonder Woman will be the first female-led superhero film of the modern age, and it's a project that has many people excited. Gal Gadot proved to be one of the best parts of Batman v. Superman: Dawn of Justice, and has led many to highly anticipate this film. Just a few days ago, we got a series of new pictures from the film (which you can see here), which had us to believe that a trailer was eminent at San Diego Comic Con this week. And, sure enough, DC did not disappoint. We know have our first, full trailer for the film. With Doctor Strange opening this November, we'll officially be two films into Phase Three of the Marvel Cinematic Universe, which was kicked off by May's Captain America: Civil War. As we get closer and closer to the other films in Phase Three, we're beginning to learn more about them. 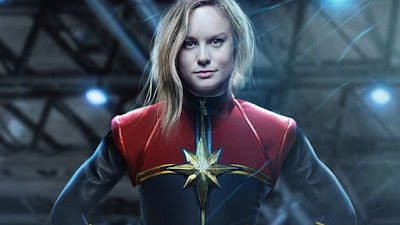 One of the films slated to come out is Captain Marvel, which is a very interesting property. 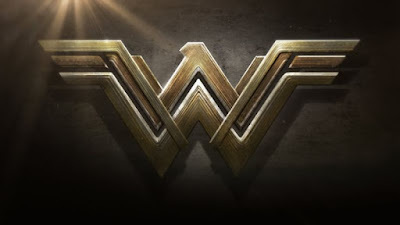 It will be Marvel's first female-led film of their cinematic universe, something DC has already beaten them to with next year's Wonder Woman. But the question surrounding Captain Marvel has been who will play her, and who will direct the film. Well, at this year's San Diego Comic Con, we got the answer to one of those questions. Doctor Strange is a fall movie release this year that I am really looking forward to. Benedict Cumberbatch was absolutely perfect casting as the Sorcerer Supreme, and with modern technology, there is so much you could do with this property. I really liked the first trailer. It definitely only teased the film, but it gave us a lot of insight on the character's background. But as to the dimension-bending madness, we only got a glimpse. But now a new trailer has been released at San Diego Comic Con, and it's full-length. 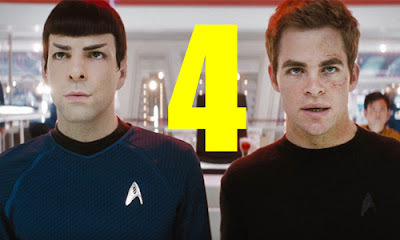 I was never a big Star Trek fan before J.J. Abrams rebooted the franchise, but I have really enjoyed the new films that have been made. They're fun, action packed, with really good performances and interesting characters. But when Abrams left the franchise to do Star Wars Episode VII: The Force Awakens, I was apprehensive about his replacement, Justin Lin. While he did a great job with the Fast and Furious films, I didn't know if that kind of loud, over-the-top action was a good fit for Star Trek. But regardless, I was still excited for this film. I was especially excited when a fourth film was confirmed, which you can read about here. So I went into this film with very high expectations. And while Beyond fits right in with the other Star Trek films as action-packed and fun, Abrams' absence is quite noticeable. 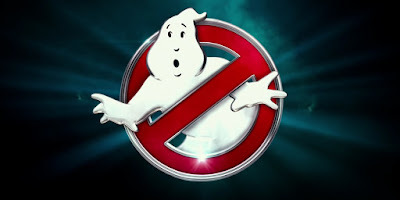 When I first heard that a Ghostbusters reboot was coming, with an all-female cast directed by Paul Feig, I was really excited. Feig did fantastic jobs directing Bridesmaids and The Heat, and this seemed like it would be a great project for him. But all my expectations went down the sh*tter when the first trailer hit. It just wasn't funny. Like at all. While many people completely disregarded this film after that, I held out hope. Maybe it was just one bad trailer. Then the second trailer hit. Then the third. Then the TV spots. And nothing was hitting the mark. But when we got positive critic ratings coming out of screenings of the film, I became hopeful again. Maybe Ghostbusters just suffered from a botched marketing job, and it is actually. So I went into the film with renewed faith. In short, Ghostbusters is a mixed bag. It has some really good, funny moments throughout the film, but the movie as a whole doesn't entirely work. 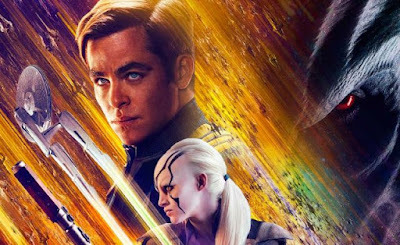 Star Trek Beyond comes out just next week, and it stands strong on Rotten Tomatoes at 91%. It is being praised as maybe being the best in this new series, which really excites me. J.J. Abrams did a brilliant job rebooting this franchise with the first two films, but who could blame him when he jumped ship to do Star Wars Episode VII: The Force Awakens instead. Fast and Furious director Justin Lin took over the third film, and I've been hesitant about it ever since. But with all these positive reviews, I am now very excited to see this film. But ahead of Beyond's release, some very interesting news has dropped concerning the future of this franchise. Pokemon has had a huge resurgence in the last couple weeks with the release of the Pokemon Go app, which allows you to catch Pokemon in the real world. The franchise may have been around for a couple decades, but this app is now capitalizing on the nostalgia of old fans, along with new ones. So with this sudden boost in popularity, it would only make sense that Hollywood studios would scramble to secure the rights to a film. 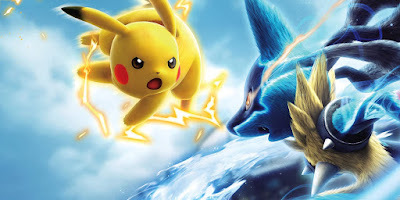 The question surrounding a live action Pokemon movie has always been whether there's a strong enough fan-base for it, and with this new app, it proves the answer to that question is definitively yes. One of Marvel's most surprising films to date has been Guardians of the Galaxy, which proved that a talking raccoon and a walking tree can be a big blockbuster hit. So, many were incredibly excited to see director James Gunn return for the sequel, set for a summer release next year. So far, we haven't gotten really anything from the film, aside from casting announcements. But with San Diego Comic Con next week, a first trailer is highly likely, along with more information detailing the film. But until then, we'll just have to make due with some basic teaser images. Coming out of the overwhelming disappointment of Batman v. Superman: Dawn of Justice, one of the highlights for fans was the live-action debut of Wonder Woman on the big screen, played by Gal Gadot. And after her winning fans over, many have eagerly turned their eyes to her solo film, set for a summer release next year. With San Diego Comic Con next week, we're most likely getting some footage from the film, which has been extremely elusive as to date. But just ahead of the convention, we are getting a brief preview of the film.